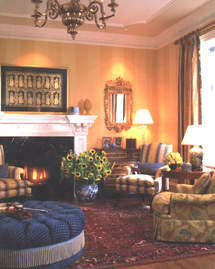 As seen in Washington Home & Design Magazine Fall 2005. The Trilogy series involves intensive and comprehensive training in the Essential 3 Decorative Art forms that a professional Artist must master to participate in any discriminating team of architect, contractor and designer. Italian Plaster Intensive. Venetian Plaster as it ought to be. 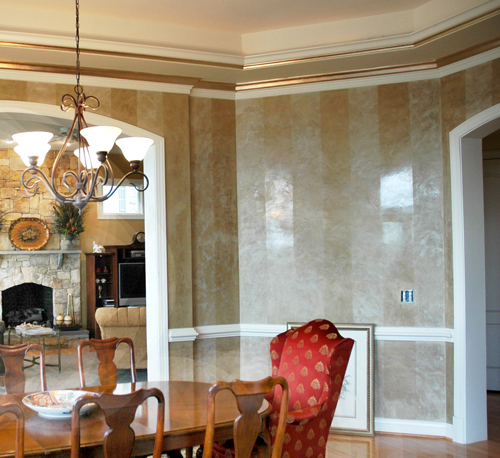 The Buon Fresco Venetian Plaster technique is a show stopper! You will never compete on the same level again. Students prepare sample boards of each of the demonstrated Decorative Art techniques graduating with Buon Fresco accreditation - and professional boards ready for presentation to architects, interior designers, custom builders, restaurants, business owners and homeowners. Scroll down for course descriptions, photos of actual work and to read comments from grads. FROTTAGE: This ULTRA high-end Oil-Glaze Stone-Finish is the basis for Faux-Travertine; Faux Limestone and Stone Blocks of the same. 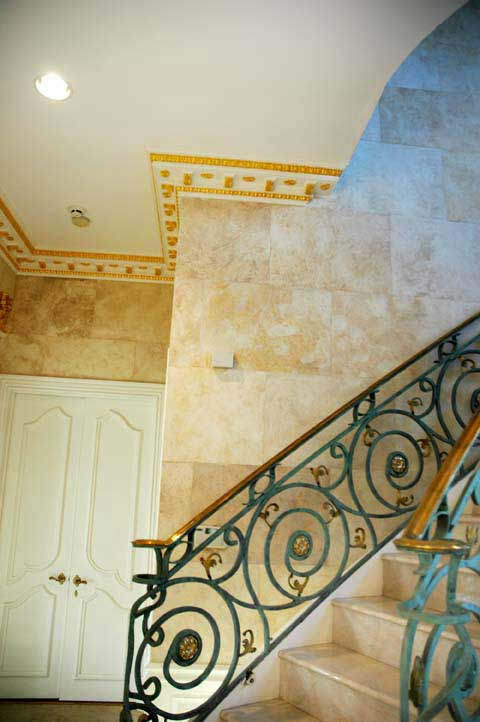 Frottage is used to achieve a highly realistic Limestone or Distempered Surface - and is ideal for 2-story hallways and tall ceilings; This Faux Finish is best achieved with Oil Glazes only. Beginning Clockwise Left Photos show: Faux Damask Stripes, Scumble Glaze for Leather, Green Strie, Frottage in Blocks, Damask Stripes, Strie in Gold; Strie in Marigold, and Strie Glaze to accentuate the features of Wainscotting below a Stenciled Venetian Plaster. 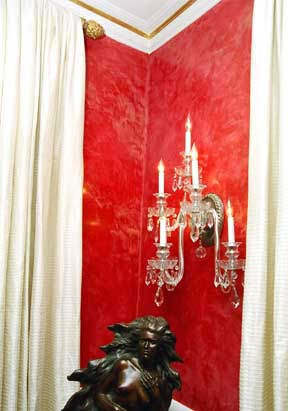 These are the featured finishes that you will learn in the Decorative Painting I Intensive Course. Though we highly recommend beginning with The COLOR INTENSIVE COURSE as a way to achieve the Color precision that is shown in these beautifully finished rooms. 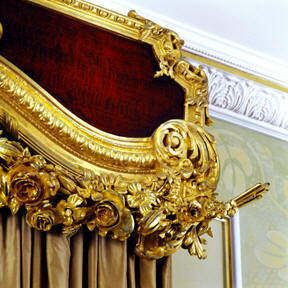 Flat Gilding - For Ceilings, Walls, Murals, Paintings etc. 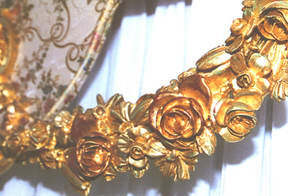 Ribbon Gilding - For Ribbon Lines on Architectural Moldings, Room Trim and Frame detailing.. .
Ornate Gilding - For Detailed Frames, Furniture and Architectural Details. 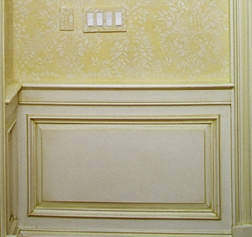 Tip Gilding - For Trim Relief , Architectural Elements and Detailed Moldings. 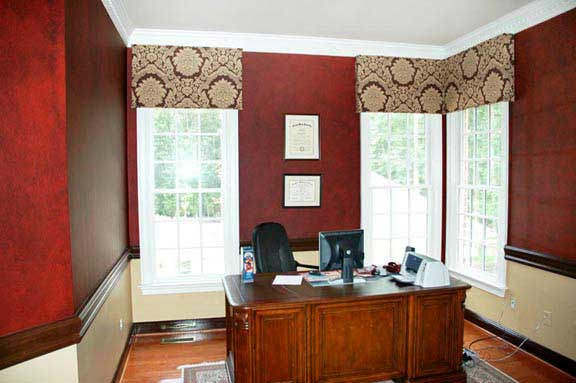 Flash Gilding - For Basket Weave or other such detailed Trim; Also for Limited Budget assignments - Flash gilding provides all the glamour of Gold with little of the high cost labor or leaf. The Academy is proud to have been selected by the Architects of the Capitol to train their Government Craftsmen to Gild the Supreme Court and Capitol Building. The Gold Leaf Intensive Course teaches Oil Gilding though the use of both water based and solvent based sizes will be taught. To provide the most accurate training, students will be working with genuine architectural elements provided by J P Weaver Ornaments and genuine 22K - 23K Gold Leaf & Ribbon Gold. 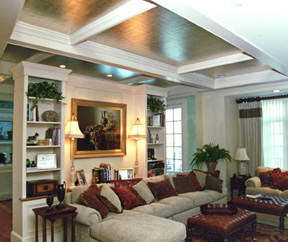 For Years now the Venetian Plaster Intensive Course has been the Academy's most popular offering. 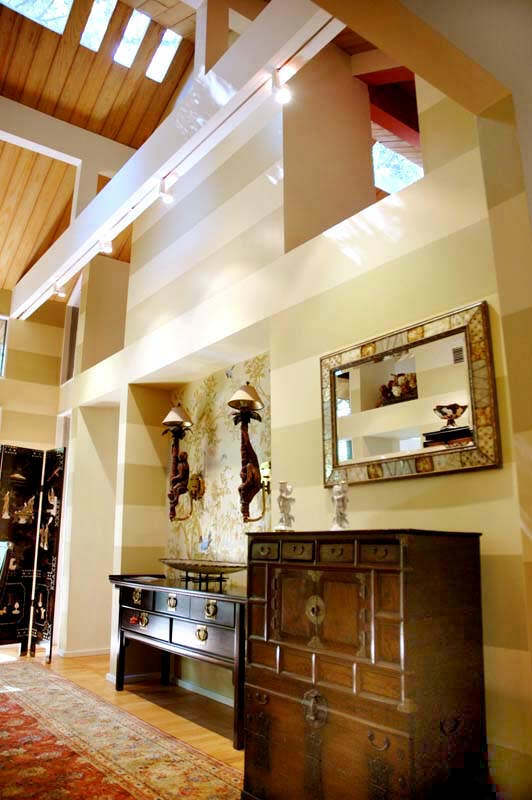 Since Buon Fresco introduced 'Venetian Plaster' to our repertoire several years ago, this extraordinary wall finish material quickly became the most requested of all of our offerings. NOTE: During instructional segments of The 'Buon Fresco� Method' of Italian Plaster application, you will work with the genuine Italian Plasters that Buon Fresco has determined provide the finest overall result. 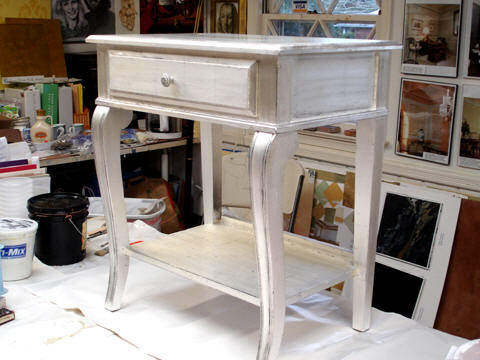 A genuine Italian Plaster product may be distinguished from the artificially named 'Venetian Plasters', sold at any number of home product stores, by the genuine polish which results in a 'mirror' like shine and has remarkable depth. Whereas artificial so called 'Venetian Plaster' is 'shiny' in the same way that a high gloss paint is shiny, but fails to provide the true 'reflective' surface of genuine Italian Plaster and has no depth. The visible difference is profound. How to Precisely Color your Custom Plaster Mix. 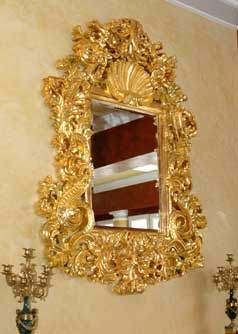 The Buon Fresco techniqueTM for a Mirror Smooth Plaster Application. 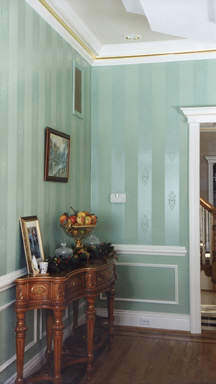 Above ^ Perfect Damask Stripes in Moon Gold Finished with 22 K Moon Gold on Crown Examine the photos, in the Intensive Decorative Painting Trilogy you will learn to reproduce these results of Mirror Polished Plaster, Flawless Damask Stripes and Perfect Gilded Ribbons. Just add Color and C' est Bon! When you are ready to take the leap to an exciting career in the arena of high end interior finishing or just to advance your current repertoire, contact the Academy to register by phone 1.888.637.3726 or email. "The course added tremendously to my portfolio." 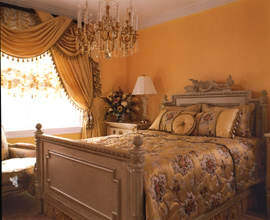 L.P.
"I LOVE Gold Leafing! and it was difficult to find where to learn it - Finally I DID!" M.B. "ALL of the information was important to me". C.O. 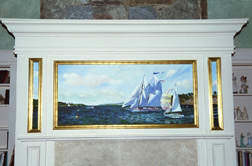 "The Gold Leaf Class will add very high end finishing to my portfolio." F.E. "The advantage of custom mixing my own colors will certainly set me apart". 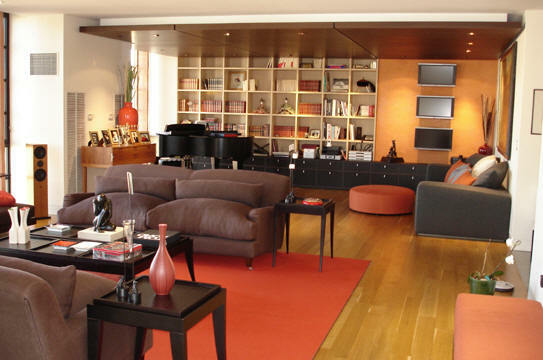 L.P.
"I will benefit professionally a LOT, because Color is the beginning of everything with Decorative Finishes." M.B. 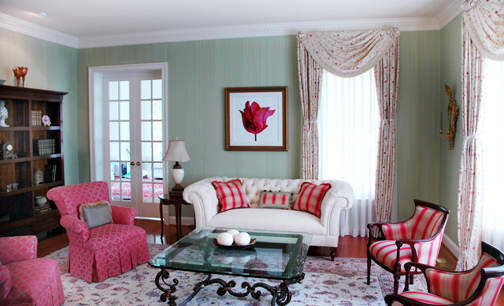 "The presentation of the color boards are very professional and beautiful." L.P.
"That's EVERYTHING! Color is what will make the difference!" F.E. The technique you taught in this class will help me get the best clientelle! M.H. "I didn't want the class to STOP". M.B. "I enjoyed the class enormously". C.S. The Class was wonderful." G.G. 'ABSOLUTELY!, but.. in consideration of competition, I'd be a bit reserved". Definitely! Because of the Finished Product! "Honestly no. Because I would prefer to remain unique in my area." "I would give a great reference of you because I liked it, but I would want to keep it a secret in Puerto Rico where I live. "YES! To anyone that is not in my area". YES! If they are not in my area". If you think the graduates are onto something good, you are right! For upcoming classes please refer to the training schedules as posted on the instruction pages of this web site. 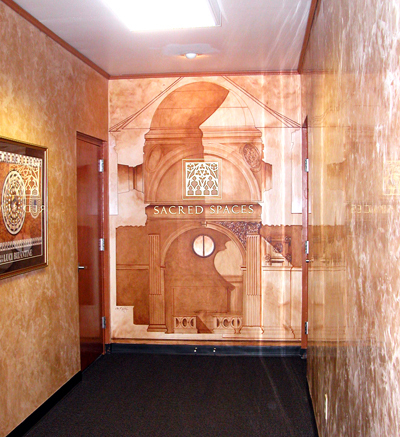 Trilogy classes of: Decorative Painting, Gold & Metal Leafing and The Venetian Plaster Intensive, may be taken on individual weekends as scheduled. The studio/school is located just outside of the Nation's Capitol in Northern Virginia. 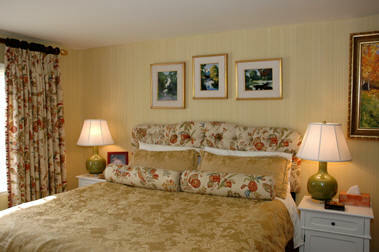 We are close to Reagan National and Dulles International Airports. Please be advised that all of the images on the Buon Fresco web site enjoy copyright protection and that United States Federal law provides severe penalties for copyright infringement. Reproduction, distribution, or transmission of the copyrighted materials on this site is strictly prohibited without the written permission of Buon Fresco, Inc.